Well, to tell the truth, I don't know a whole lot about robins except they like angle worms and night crawlers for lunch. That for sure wasn't going to work here. I do remember though one time flyfishing though on a forested trout stream in Montana, watching a large group of robins fly across the stream where they were catching flying insects. Now, that's what swallows and other small diving swooping dodging birds do to catch their prey rising from the water itself. Those are small insects that fly fisherman emulate to catch the trout. This time though they were 3 inch long salmon flies, huge flies that big trout and a big awkward bird like a robin just might catch for his own lunch. And they were. I was amazed watching them do it. Actually, it's often what senior citizens have to do when physical infirmities force us to change our lifestyles. For those robins it was adapting to a different opportunity for lunch. Since then I've learned that robins do that adapting all the time in ways I've never seen. They go to birdfeeders. They will eat suet out of the cages that the woodpeckers like. Some don't migrate south to leave the colder climates of the upper Midwest. Perhaps, someday further north of us, they will be found in Manitoba or Ontario or.... 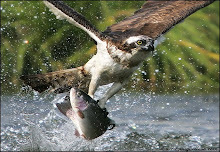 Even further as climate change reeks its destruction on the worlds ecosystems. About a week ago or so on the first sunny warm day Barb and I spent time outdoors soaking up the sun. Other people with dementia joined us and soon I did my "thing" greeted them all, tried to get them mostly laughing, even smiling. As the aids began bringing out people in wheelchairs, we put all the chairs in a large circle so we could see each other and enjoy the day together. Too much excitement in dementia land is not always good so when that happened I proposed we do this once a week and suggested we give our new club a name. Several names were offered by the group and the winner was the sunshine club. As the meeting adjourned I carefully had chosen not to mention that a blizzard was forecast for the next night and it might be a while before the sunshine club could meet again. It was a good day for all and particularly for Barb who especially enjoys the camaraderie and the friendship social gatherings. 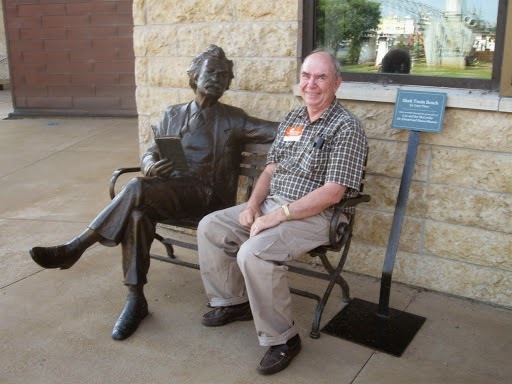 The corker, however, was shortly later that same day Barb and I were standing in the luncheon area and three people came around the corner from the hallway. These were people I had never seen before because one of them was a new resident who had only been in memory care for three days. What turned out to be her daughter came rushing up to Barb saying" Oh Barb so glad to see you again," which was followed by hugs and more hugs. Her husband followed up with a friendly greeting to me and Barb. I then introduced myself as Barb's husband and wondered how they knew Barb. The woman then explained and told me that her mother was so frightened and upset when she came to Cottagewood two days before that Barb had approached and offered to be the elder ladies friend, told her the apartments were very nice and wondered if she could take her hand by show her around. That of course is the real Barb I've known and loved more than 53 years now..
Um....it is snowing like the dickens in Chicago today. My poor Star Magnolia blossoms (bloomed yesterday) are heavy with ice and snow. Discouraged, I know deep in my heart that there are joyous blossoms beneath the snow regardless. 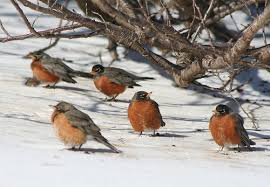 Robins usually come here in PA in large flocks during February to eat juniper berries. They eat and leave quickly and we don’t see them for another month. It always makes me happy because I think that spring could not be too far away. Sometimes that’s true true, but other times snow happens again. That was wonderful that you had such a nice day with your lovely Barb. Being outside and enjoying nature makes everyone feel good. What a wonderful post, and story. When the robins came along at the old house, they were part of my ground crew, cleaning up, so to speak. Your simple activity helps people more than you think. I've seen robins in every month of the year where I live in Alberta.Robins eat berries so there's lots of food for them. Robins in the UK seem to be solitary birds. Only once have a seen two together, which I believe was the start of the mating season. Thank you for writing about your dear lady and I am so pleased she is able to get involved with the goings on at the new Sunshine Club. Good for you, too. Tough being a bird in that kind of snow. Wish them luck--send them to Arkansas--no snow. That had to be a wonderful moment for you to realize Barb is still so caring and helpful. It has to help her also. We all need to reach out more. LOVELY! I posted a tribute pic to you in my blog post, "Springing into the season"
The Sunshine Club is such a great idea. Hope the club meets a lot, also meaning that I hope we have many sunny days. I'd like to think the club could also meet on days you aren't present. Barb is so kind to the other residents. The newer ones, especially need friendship. Am sure Barb was like this with her students! It seems like Barb is carrying on being a special person. Those poor little robins look so fluffed up to keep warm. I imagine they were surprised by the unexpected return of winter. I liked your story about adapting to new conditions, which it seems is exactly what getting older seems to be all about. Your wife sounds like such a sweet, wonderful person and her real character shows up in when, even in her difficulties, she is busy helping others. And you, too, with the time you spend making things more pleasant with little things like the Sunshine Club.